Crate training is an important component of nurturing puppies and dogs. Using crates we can teach our pet to behave, to toilet train and know what acceptable behavior is and which behavior is not going to be tolerated. A crate can even provide a secure and safe place for our pet, which will calm them down and make it them feel better. But in order to achieve everything listed above we need to select the right crate for us, as owners, and for our pets. There are specific guidelines regarding appropriate size cages, but we also need to take into consideration the material and overall style. So here are listed some of the best dog cages and crates according to the overall appeal, comfort, usefulness, and reliability. The manufacturer of this dog crate is a family owned company called Crown Pet Products. They are creating a unique, decorative and qualitative pet retail products, which are offered to their customers at a reasonable price. The Crown Pet Products are not only functional but also very decorative and will fit into your home décor. Also, as most of the products are made out of rubber wood, they are eco-friendly and don’t cause harm to the environment and any living creature. Crown Pet Products creations are available all over the world and they have improved their online marketing as well since many people have switched to online shopping because it has become very popular. And, if you provide your products online, you can reach a larger audience, being one of the reasons why the Crown Pet Products has become so popular. 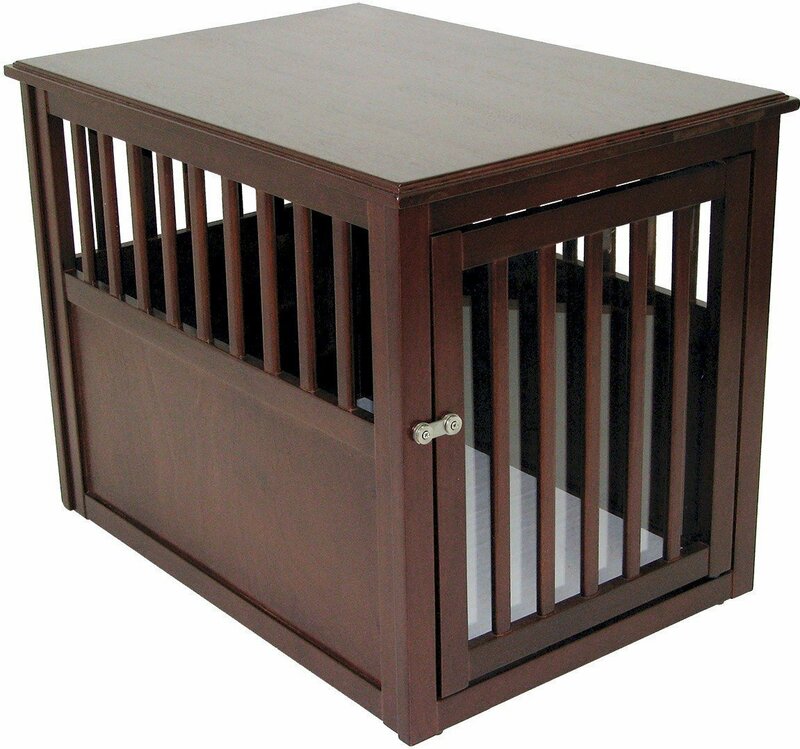 This pet crate is made out of rubber wood which is a very durable hardwood, similar and often compared to the teak. It has a stained and lacquered finish and is available in three different colors, different shades of brown – brown, mahogany and espresso. Because of the material and fine finish, these crates for dogs are very similar to fine furniture and will go with your home décor nicely. Because the pet crate is made out of strong hardware, it is durable, strong and sustainable, therefore it will serve for many years. 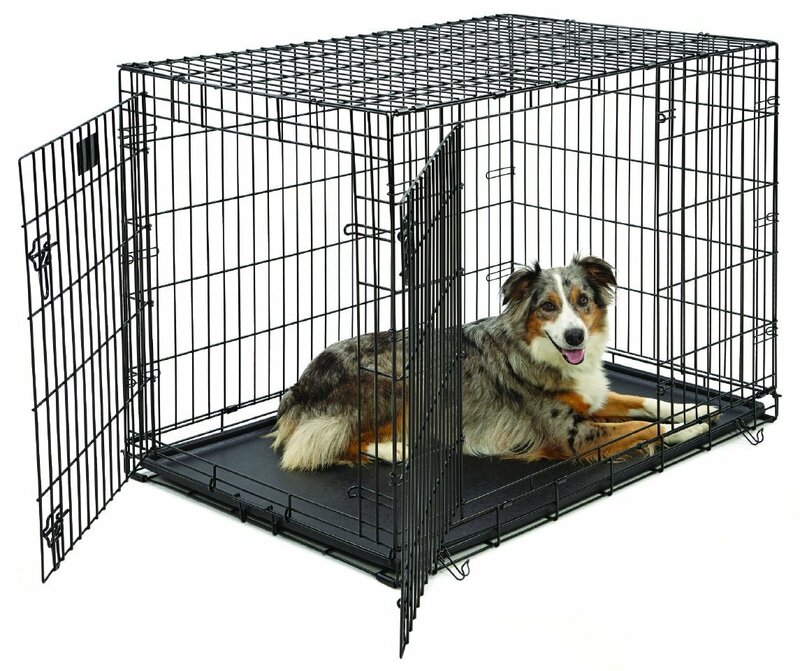 The doors of this dog cage are designed with stainless steel latch, so they can be secured and fastened, and you don’t have to worry about your pet breaking out of the crate. As many pet owners use crates for dogs to toilet train the pet, the flooring of the crate is waterproof, eliminating any absorption of liquids and odors. Many of the crates for dogs don’t provide a view for your pet outside the dog crate which can cause anxiety for your pet, but Crown Pet Crate Table does provide a 360-degrees view and an excellent ventilation so that the crate does not overheat. Although this dog crate sounds great, it won’t be suitable if you have a large dog, as only two sizes are offered, large and medium, but the medium is meant for smaller dogs, and size large is meant for medium sized dogs, so larger dogs might not fit in the Crown Pet Crate Table. The Merry Products manufacture different wood and hardware products and accessories, but mainly are focused on the production of different crates and pet houses. But they also offer furniture and even hardware kid toys. They are based in China, Asia, but because The Merry Products are sold online, customers worldwide can purchase from them. The Merry Products 2 in 1 dog cage is designed in order to provide your pet a secure and safe place to rest or to use the cages as a tool for housetraining the pet and to help to discipline your doggy. This modern dog crate comes in only one color – walnut, which is a shade of brown. Made from hardwood material with a solid wood veneer cover which will go well with your interior design and look stylish. This dog crate is a 2 in 1 products, as its main function is being a crate, but it can also be transformed into a gate and configured to fit any opening. The gate has pin hinges which will help to place the gate as needed and configure it to fit the necessary shape and form. The crate comes in two different sizes to give you an option and to offer the right dog cage for your doggy. As crates are often used for toilet training, this Merry Pet 2 in 1 pet crate is equipped with a black side-out tray, which makes it extremely easy to maintain the dog cage. 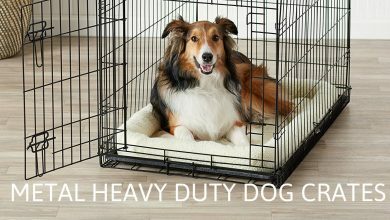 And the rust-resistant feature makes the dog crate durable and it will last you for a long time. As fresh air and good ventilation is important, the dog cage has ventilation windows to provide enough air and the perfect temperature for your pet. 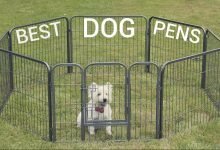 Overall, this is a great product, which can be used for different purposes – as a dog cage and as a pet gate. But, if you have a larger pet, which likes to chew on things and is known to be able to get out of crates, this won’t be the best choice, as it is made out of wood and will be destroyed easily. All in all, nice looking dog crate which will add a nice touch to your interior, however, you do pay for the design as it is a bit pricier. Manufacturer: Casual Home Worldwide Inc.
Casual Home Worldwide Inc. is an American company which focuses on providing ready-to-assemble furniture and accessories. They have been in the business for over forty years, so they have perfected the design and quality of their products. Altogether, they provide great and stylish products, mainly produced out of solid wood and have a great value for their products. 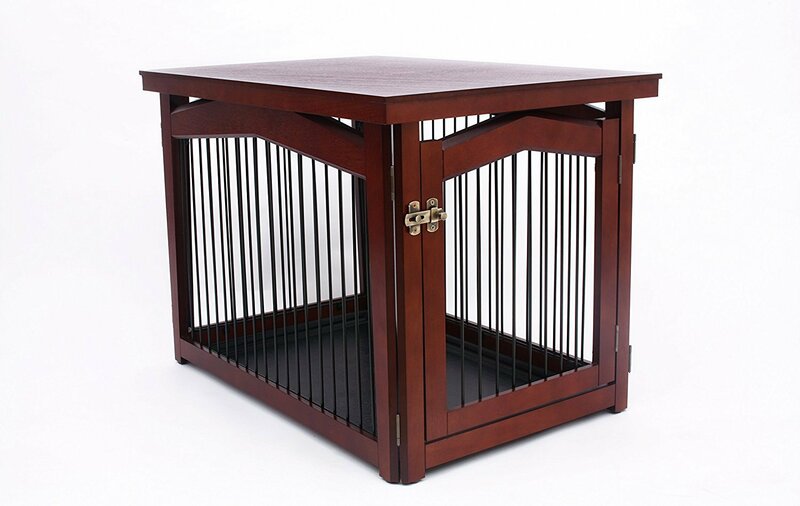 The Casual Home dog cage has a very beautiful design which is similar to the fine furniture, as it is made from hardwood. This best dog crate will not only look great in your house but will also provide a cozy place for your pet and help you to house and toilet train the doggy. Two sizes are offered, small and large so that the crate can be purchased by different dog owners, because it is extremely important that the pet has enough space in the dog crate to stand up and turn around, but not more than that. As it is important for your doggy to see what’s going on around the crate, it has wooden slats which will allow the pup to see their surroundings and ensure fresh air circulation. 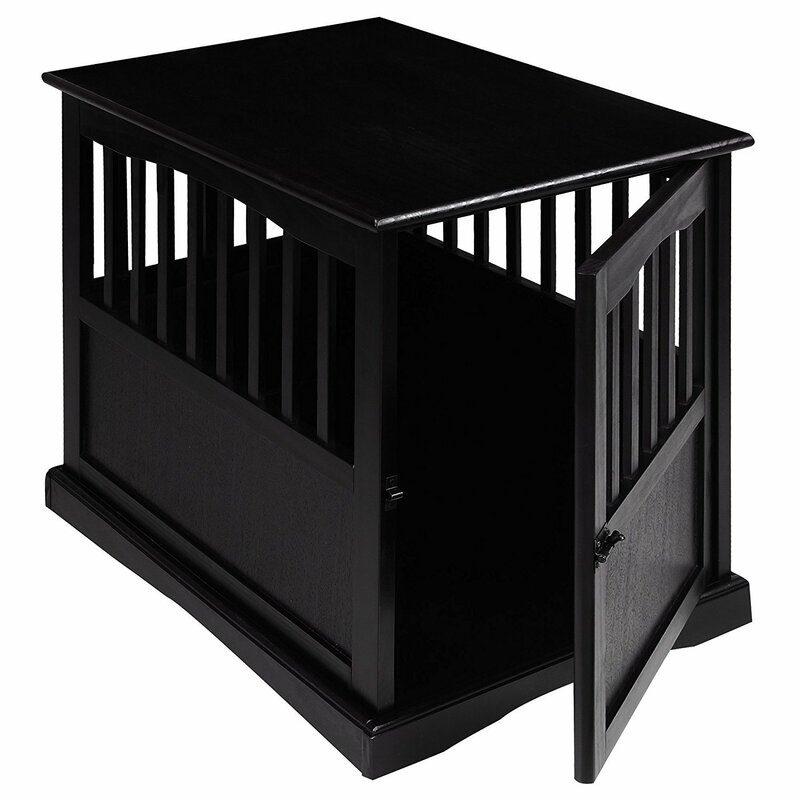 As the dog crate is made out 100 percent solid wood it is very sturdy and great quality. The Casual Home dog cage has a latch closure so that you can easily let your pet in and out. But, if you have a larger dog that has a history of chewing on things then this pet crate is not for you. Because your pet will be able to get out of the dog cage easily. And, the bottom of the dog crate is not made out of real wood, which it is done to ease the cleaning of the crate, as accidents tend to happen and crates are often used to toilet train a pet. Overall, this a quite similar dog cage to the Merry Pet crate, but you can get this crate for a smaller amount of money. The brand of this dog crate is Amazon Basic Company, which offers many different kinds of everyday house items. Amazon Basics dog crate is perfect for small puppies and already grown adult dogs. This crate can be used for toilet training, house training, correcting obedience problems, setting boundaries or simply providing a time-out place for your pet. It is important to choose a pet crate which is comfortable and the right size for your doggy. This metal pet crate has two doors, one in the front as usually similar crates do have, and another door on the side. The double door setting provides easier access to your pet and keeps everything at a reach when you are cleaning or re-arranging the pet crate. And the metal doors have slide-bolt latches for the safety and in order to ensure that your pet has no options to get out. This modern dog crate is designed and made out of metal wires to ensure strength and safety so that there is no possibility that your pet can get out of the crate itself. And also, the metal wiring provides great ventilation and visibility for your puppy. It is extremely important for the crates for dogs to be the right size, not too small and not too big. Therefore Amazon Basic Company has introduced divider panels so you can arrange the necessary size as your puppy is growing. The Amazon Basic cages for dogs are easily set up, and you don’t need any tools to do it. If necessary you can also fold it flat again so that it doesn’t take much space when stored, and so that the crate is easily portable. And in order to provide easier maintenance removable, washable, the plastic pan is at the bottom of the crate, in the case of toilet accidents or if water or food spills. Overall, this Amazon Basic best dog crate is made to be very practical rather than to be an interior piece, but if you don’t have any objection to the style and look of the pet crate than this is an excellent choice. 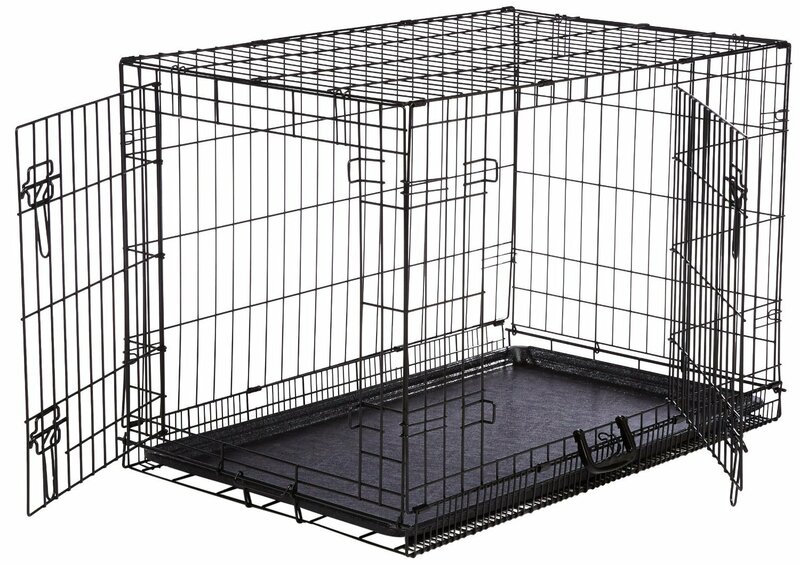 Other features: comes assembled, with divider panel so you can adjust the size of your crate. Petco is a leading pet product retailer, focusing on creating bonds and relationships between people and their pets. They have been in this business for over fifty years and have perfected their products, providing experienced services and advice. Petco is a quite large company as they employ over 25.000 people in more than 1.500 different locations in America, Mexico, and Puerto Rico. But as Internet shopping has become more popular, Petco also now sell online so they can reach the rest of the world as well. Petco crates for dogs are safe, secure and affordable. They are already assembled, when received you just have to set it up in the desired place. The divider panel is also included so that you can adjust the size of the pet crate as necessary and successfully toilet train your puppy. Except for the size x-small, this crate will not come with a divider panel, as it is already small. This animal cage also comes with a plastic pan on the bottom for easier cleaning, as many owners use these crates for toilet training. Petco offers four different sizes so that you can choose the most appropriate one for your pet, as it is extremely crucial for a dog to be crated in the appropriate cage. Overall, the Petco metal crates for dogs are durable and long lasting, they have added a black powder coat finish to increase the appeal and rust resistance of the pet crate. But, for your pet’s safety remove all collars and leashes before allowing your pet to enter the dog crate. The crate is extremely easy to assemble and also to break down, so you can take it with you on trips, camping or simply for storing. Although this animal cage is manufactured out of metal, it is relatively weak and larger dogs and pets which can get out of crates won’t stay in for long. The brand manufacturing and distributing MidWest dog crates is called Midwest Inc, they have been operating since the early nineteenth century, for almost a hundred years. Although MidWest is based in the United States, they have created an online shop so people all over the world can be reached. Overall, they provide a large variety of pet crates in different styles and sizes so you can find the perfect one for your pet. You can be sure that you are receiving the best quality item when purchasing from MidWest because each product undergoes serious testing and evaluations in order to determine whether it has the quality they want to offer. MidWest dog crates are designed to achieve the best quality, security, and comfort for the owner and for the pet. They are easily set up without using any tools. 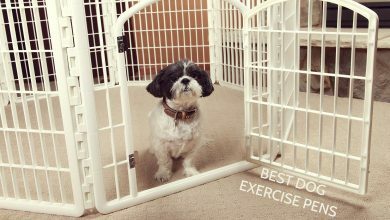 For security, these cages for dogs have safety slide-bolt latches so that your puppy has no way to escape. The corners of the crate are rounded for safety, and the metal is treated with a satin-black finish in order to ensure that the cage is going to last longer. When you purchase MidWest dog crates you will have a removable and washable plastic pan and a divider panel included. 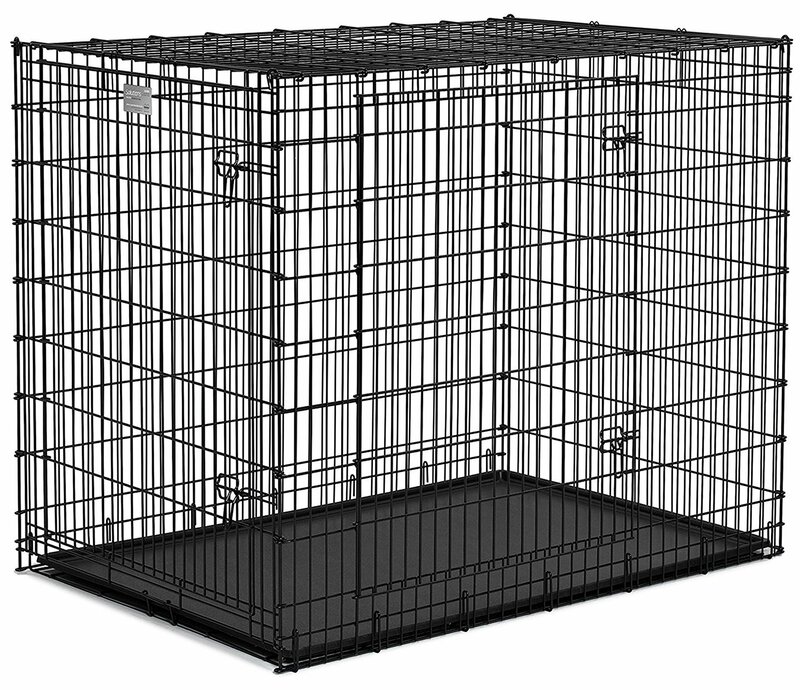 So you can easily maintain a clean pet crate and adjust the necessary size. If you have a necessity to move or store the crate, it will fold down easily and won’t take up much space. Overall, the MidWest dog crates are available in six different sizes, so you have a variety to choose from. The producers have thought about the owner and included a plastic carrying handle for easier transportation and rubber feet so you don’t ruin your floors. 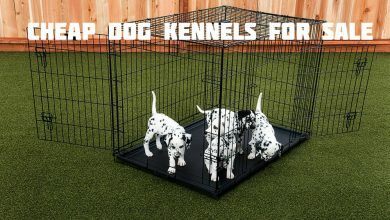 Although this product seems great and worth the money, if your puppy or dog is overly active or likes to bite and chew on things, then the MidWest pet crate isn’t the best option. 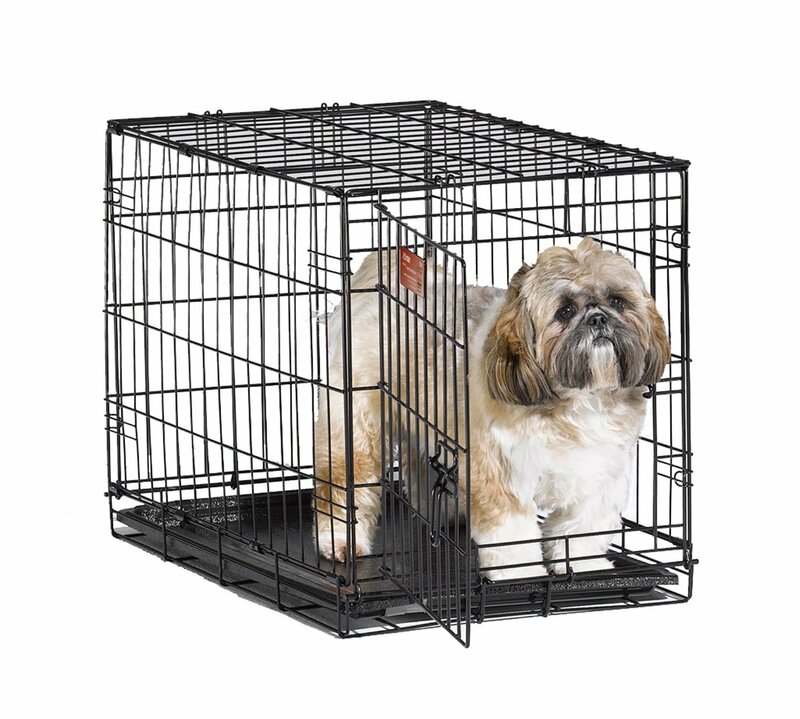 Because the metal bars are relatively thin and won’t hold the active dog in a crate for long. A divider panel is included so you can arrange the right size. 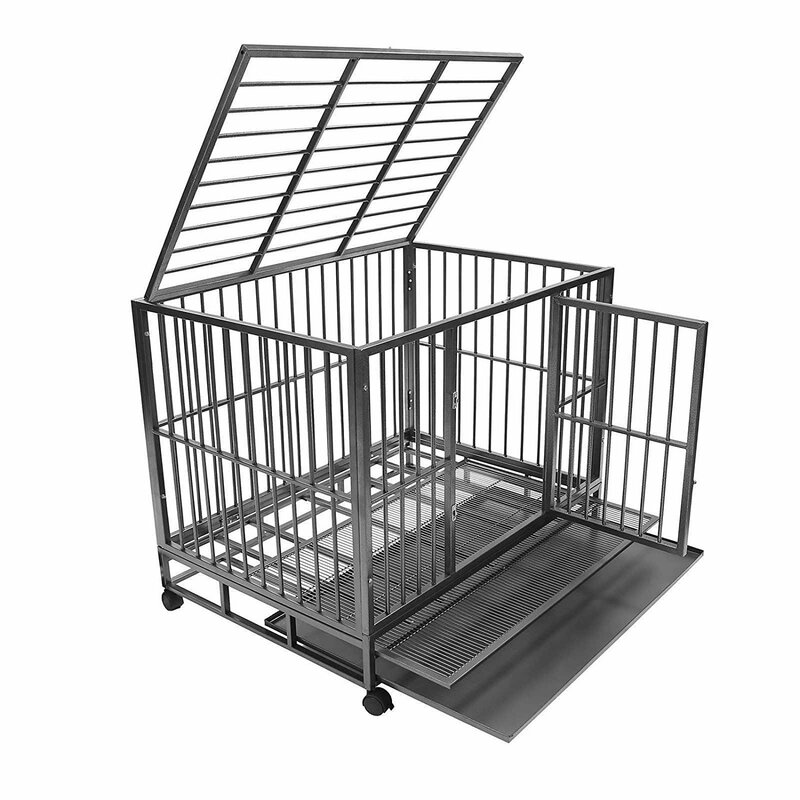 The MidWest iCrate Folding Metal Dog Crate is manufactured by the same company as previous pet cage. It is a worldwide known and trusted brand providing various styles and types of pet crates for all tastes. They offer their customers excellent quality and have gained popularity all over the world, as MidWest company has been operating for almost a hundred years and do know what to offer customers. 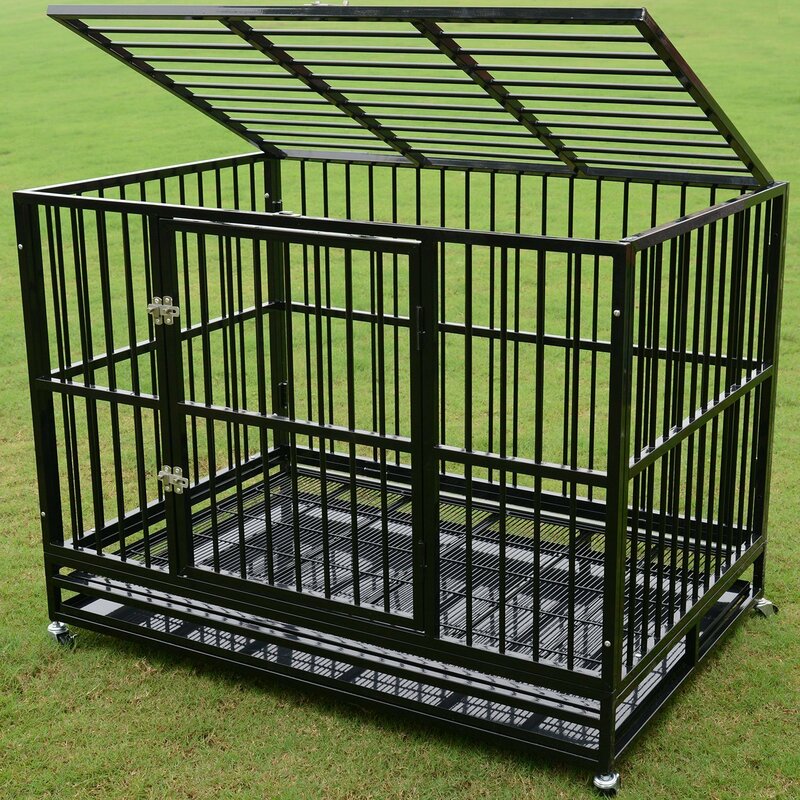 This animal cage has seven different sizing option so that everyone can find their perfect one, as it is extremely important for a dog to have the correct size of crate, not too small and not too big. Your pet should be able to lay down, stand up and turn around in the pet crate, but that about it. If you are going to buy a crate which is far too large, the toilet training is not going to be successful. If you have a puppy, but don’t want to purchase a new crate every month, this is a great solution as the MidWest pet crates come with a divider. You can research how large crate grown dog is going to need, and buy that size. While your puppy is growing just arrange the crate using the divider panel. This way you won’t have to spend money on the new crate while your doggy is growing. It also comes with a leak-proof plastic pan, for easier maintenance, as accidents will happen when you are toilet training your pet. And not only accidents, most probably if you feed your pet inside the crate food and water will spill from time to time. The crate itself is portable and you will have no problems setting it up, as it folds down flat if necessary without any difficulties. So you can take the crate with you when traveling, or it is going to take up a little room if you need to store it someplace. And, lastly, in order to keep your pet inside, the animal’s crate has a metal slide-bolt which cannot be undone by animals. SmithBuilt is a relatively new company, founded in only 2007. They are a family owned company manufacturing pet crates with an excellent quality for the best possible price. Although their products are not the cheapest ones out there, they have found a compromise between quality and affordability. These best crates for dogs are very easy set up and broken down if necessary. As they are designed in a suitcase style, meaning that you simply fold the pet crate if you need to transport it. So you can take the crate with you when traveling or on vacation, or if you want to store it, the crate won’t take up much space. The plastic tray that comes with it is very easily maintained and cleaned and won’t be cold and noisy. It is more pleasant to have a plastic rather than metal pan underneath the crate. And, manufacturers also have included a divider, so you can arrange the necessary size while your puppy is growing. Overall, the SmithBuild Crate is a great quality product, which will be easy to setup and maintain, as manufacturers have worked on all the little details to provide the best possible product for a great price. The crate has two doors so you can access your pet easier, and if needed, rearrange and clean the crate. The Paws and Pols dog crate is manufactured from a premium quality metal and crafted using commercial-quality materials, which are going to be safe, durable and long-lasting though any weather conditions as the dog crate can be used indoors and outdoors. The durability and long-lasting effect are reached by using an all-steel, high strength metal wire, which is welded into a tight mesh wire pattern. You can use this crate for many different animals which need to be crated, but the main focus and manufacturing purpose is dogs and different dog breeds. 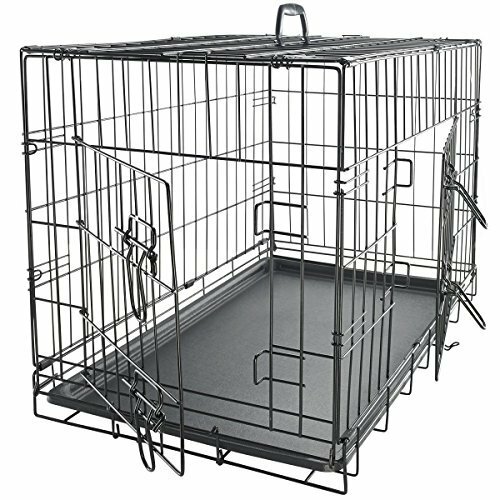 This crate has multiple doors for easier access to the pet, and for your pet to be able to access the pet pen from more than one opening. But, the smaller sized crate is not equipped with multiple doors and has only one. The doors are equipped with slide-bolt latches which will keep the doors securely shut and your pet from escaping. The setting up does not require a lot of effort and is going to take only a few minutes, as the crate comes pre-assembled. And you will not need any tools to set up or take down the pen. The crate is lightweight and it comes with a slide-out tray which is made out of long-lasting and strong ABS plastic. It also has a lip around the perimeter and is held in place by a retaining bar, which not only ensures that the bottom tray stays in place, but also makes sure that the cleaning and maintaining process is easy. As you can take out and put the tray back in without having to open any doors. The metal crate itself has rounded edges, which are designed to avoid any possibilities of your pet or even your children and yourself obtaining any injuries. As many small puppies grow into larger dogs, you want to provide the right sizes crate without having to spend a fortune. Therefore the designers at Paws and Pals have included a divider panel, which will be useful for those who have small pets and puppies. And, many of the dog owners do not use the crates all of the time, so you want to have a crate which is easily stored and does not take a lot of space. You can collapse the Paws and Pals crate to take up minimal space, and it even comes with a removable top-mounted handle for more convenient carrying. 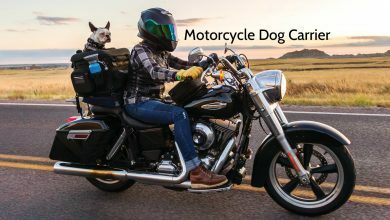 This dog crate is a product of the already mentioned company – MidWest, which is a worldwide company, with almost one hundred years of experience. They provide many different styles and sizes of pet crates. And you can be sure to receive the best quality item as MidWest has always put their customers’ needs first. The MidWest pet crate is the best dog crate out of the extra-large crates, as it is extremely large in size (54L x 37W x 45H inches) and can fit even the largest pets. Often when your pet is quite large in size, it can break through and ruin crates. There are only a few that can actually hold the dog in and you can be sure that your pet isn’t going to be able to break out. The crate itself is a double door cage, so you have easier access to all parts of the crate when cleaning it. As many owners use pet crates for toilet training, this pet crate has a removable, durable and leak-proof pan, for easier maintenance while your pet is toilet training. As larger dogs have it easier when trying to break out of the crate, the MidWest pet crate is designed with two heavy duty secure slide-bolts for extra safety. Also, this pet crate has a drop pin construction, which ensures safety and creates a cage which is very hard to get out of, even for the largest pets. And, in order for the crate to last you longer, it is coated with a protective anti-rust coat. 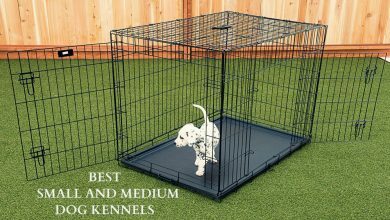 Overall, the Midwest Solution Series “Ginormus” Double Door Dog Crate is the perfect choice if you have a large dog breed, for example, a Great Dane. It has a removable leak proof pan, which will ease your cleaning works if toilet accidents occur. And, if you have a puppy, this pet crate has a divider panel, so you can adjust the crate’s size. This pet crate is designed and manufactured by a company named Walcut. Which is a worldwide manufacturer and distributor, mainly offering their products online, so they can be accessed all around the world. This way the company can get known all over the world and increase their sales significantly, as more people are able to purchase from them. Walcut provides a variety of different cages for animals, for example, bird cages, and also other kinds of furniture and accessories, such as office chairs or bathroom vanities. The quality of the Walcut best crates for dogs is exceptional. And this is one of the reasons why they have become so popular all over the globe. The crates are made out of heavy metal steel, making the crate durable and hard to be spoiled. It is equipped with four casters making the crate movable, as it is quite heavy and wouldn’t be easy to lift. Two of the casters are lockable to avoid unwanted movement and deviation from the place. The cool dog crates from the Walcut Company are equipped with a steel tray on the bottom, which is removable. So it is easier to clean and maintain the crate in case of toilet accidents or on occasions when your pet spills food or water. And, to make it even easier and more accessible, there are two doors, on the sides and at the top of the crate. Although the crate is made out of steel and is quite heavy, it does fold down flat, making it portable, and if you want to store it, this best dog crate won’t take up as much space. The brand manufacturing this pet crate has been already mentioned above and is called The SmithBuild Company. As already stated, they are a relatively new company and have been operating only since 2007. But, they also have already proven themselves as a trustworthy and qualitative company. This modern dog crate is made out of metal steel which is extremely strong and won’t allow your dog to get out or ruin the crate. The crate has a door on the front of it, but it can also be accessed from the top, as it lifts up. The door has two slide-bolt latches and the top has one of these. The crate itself is treated with an ultra-durable and multi-layer finish so that it lasts much longer and has anti-rust, anti-corrosion fade resistant functions. Because of these attributes, the crate can be used outdoors without worrying about the weather ruining it. It comes with a removable metal pan and a floor grate, for easier maintenance in cases of toilet accidents, or if your pet spills water or food. And the pan has an integrated lip all around it, so the mess stays in the crate and doesn’t spill outside and around your house. The crate also comes with four caster wheels, so you can move it around more easily, as it is extremely heavy. Two of whom can be locked to avoid accidental movement of the crate out of place. The only downfall of this dog cage would be that this crate is extremely heavy, it weights about one hundred pounds. When receiving the SmithBuilt pet crate you will receive a partially built product which will need little assembling. Overall, a great crate for pets which are known to chew on things and for those who are able to get out of wooden crates easily. As this crate is made out of harder metal, steel, and will be much harder destroyed. The Elite Fields Pet Products is a popular and well-known company all over the world. They offer a variety of different pet products since 2004. You can be sure to receive excellent customer service when ordering from Elite Fields Pet Products because they appreciate customers and believe that customer service and fast response is extremely important for a company. This best dog crate comes fully assembled, the crate can be set up and folded down within a few seconds, and don’t require any tools for the job. It is made out of several different materials: the tube, which holds the crate up is made out of steel, the crate itself is made out of fabric, and the doors are manufactured out of mesh. 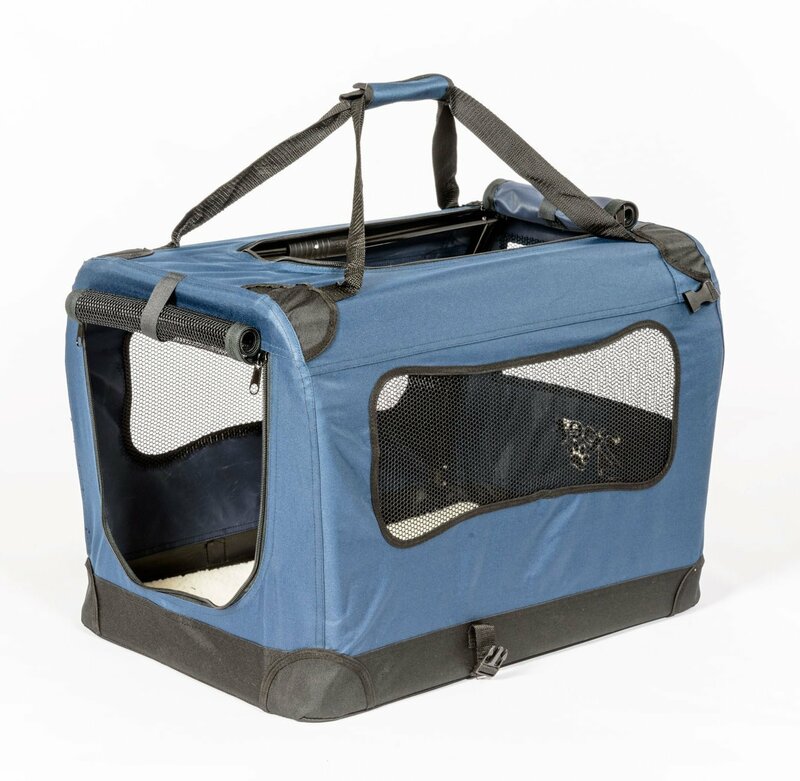 Because the crate is made out of fabric, it is well ventilated and provides your pet with fresh air at all times. These fancy dog crates from Elite Fields have three mesh doors, one on the top, one on the front and one on the side, providing sunlight and fresh air for your doggy. Even though you might think that having fabric pet crate can be more work, the cover and bed of the crate are removable and washable in the washing machine. So you don’t have to worry about keeping the crate clean and maintaining it. 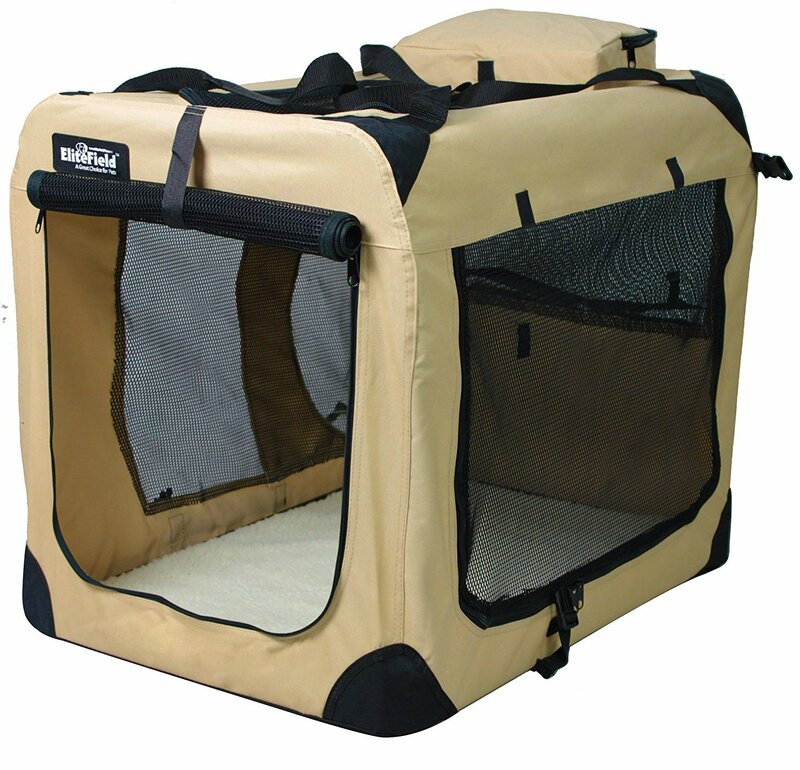 The company, which manufactures this particular soft pet crate is called 2PET. They are quite a new company, created in 2014, however, they don’t lack the experience or the skills to create and sell quality products. 2PET consists of pet lovers, many of whom own their own pets as well, so you can be sure that this company makes products that are highly functional, easy to use and tailored to fit every breed of dog possible. Lastly, there is this 2PET best dog crate, which has many great features that make it one of the best soft crates on the market. 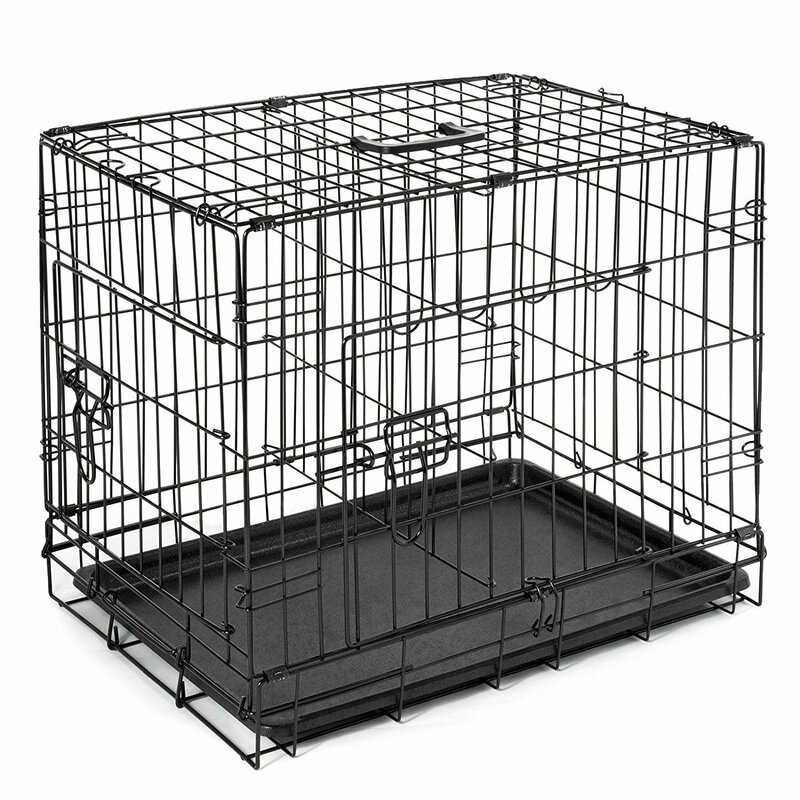 Among these characteristics are things like washable and waterproof interior, which will make the cleaning of this crate very easy, steel frame that will give structure to the crate and make it suitable even for big dogs, as well as new anti-chew zipper technology, which will prevent your pup from getting out of the crate by chewing the zipper closure. Additionally, the top handle will make it easy for you to take the crate anywhere you go. The foldable design of the crate will also allow you to easily store the crate when you aren’t using it. 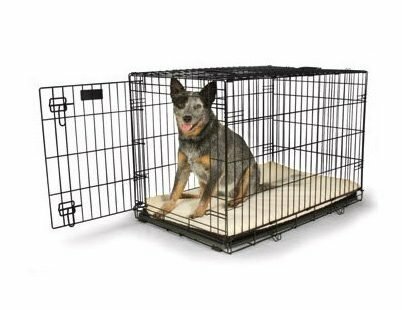 While the large size and color availability will make sure that you can choose the crate that is suited for your dog and in which your dog feels comfortable and safe. The company manufacturing this pet crate discussed in this review is called Noz2Noz, an Asian company, providing different accessories and home appliances. Their doggy crate is designed to allow you to take your pet with you when traveling or simply for crating your pet at home. To ensure that the crate is easily maintained it is constructed with a water and liquid resistant base. You just have to wipe down the mesh material with wipes or paper towel and it is good as new. Also, it is advised to use an odor and stain remover on this crate which will help you to keep these cute dog crates fresh and nice smelling. You can also wash it, but don’t use the washing machine, hand wash this dog crate and let it air dry. 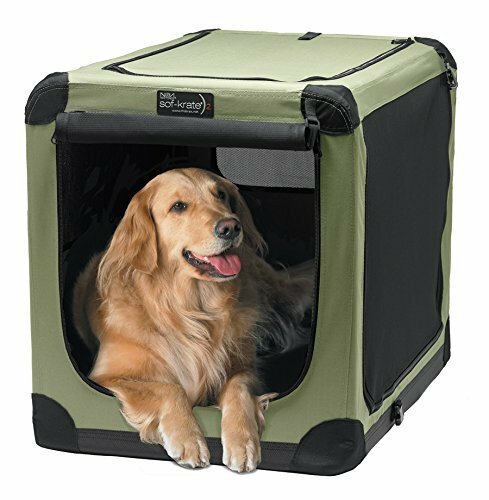 The crate is made out of heavy-duty tight weave mesh fabric, which is extremely durable and well-ventilated, and which will provide your pet fresh air. The only downfall is that if you have a larger pet you might want to consider picking a much harder crate, made out of wood or steel as this modern dog crate will be too small and won’t be able to hold the weight of a larger dog. Soft material, so won’t be suited for large dogs and ones who are able to get out of crates easily. Overall, when choosing a pet crate you have to think about your dog first, and after that only about yourself. Each pet has their own preferences, some like to be crated in a crate from which you can see everything around, but some doggies don’t mind being put into a wooden crate with lesser visibility. Also, it is very important to know if your dog has a chewing issue or not, because, there is no reason to spend hundreds of dollars on a crate which will be chewed up within a week. So for these doggies, it is best to choose a metallic crate. And lastly, the size of your pet plays a major role in choosing the crate. Your pet should always feel comfortable inside the dog cage, but without having too much space. 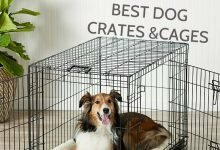 So when purchasing one of these best dog crates and cages, you should definitely do your own research and see which crate is the best for your pet. We can attest that PupsBest puts all product to the test to find the absolute best before you invest. Sharing a Bed with Your Dog: Good or Bad? What’s the deal with dog shock collars? © Copyright pupsbest.com. 2019. All Rights Reserved.